Review PreserVision Original Soft Gels I use these gels to help preserve my eyesight as recommended by my consultant. I find the ordering and delivery very prompt and efficient and I consider the product to be good value for money. My vision remains stable and the gels may have a vital role in this. Review PreserVision Original Soft Gels I take this supplement on medical advice for age related macular degeneration. Since starting with it, I have had no recurrence of the symptoms. Review PreserVision Original Soft Gels Can't tell whether it's helping (effects are long-term, to prevent degradation rather than curing current situation), but it's supposed to. - Vastly cheaper if order from USA - why? Please, VisionDirect, lower your price on this object. PreserVision Original Soft Gels Great product! PreserVision Original Soft Gels I have been taking these for a while now and they seem to be alright. We take supplements for strength, digestion and our hearts, so why not for our eyes as well? 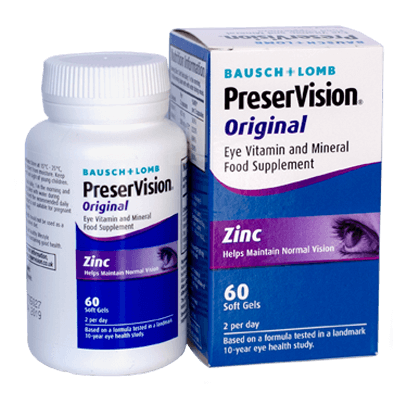 PreserVision Original Soft Gels from Bausch & Lomb are designed to support healthy eyesight in later life.